Fraisa is a family-owned business that offers its customers a complete range of solid round tools with endmills, drills and taps. They provide a full customer service offering with logistics, customized tooling, regrinding and recycling of tools. With its headquarters in Switzerland, Fraisa has a strong position in Europe and in the last ten years have entered the United States and Chinese markets. Unique to the market, the TapXcell is a complete production package for tap manufacturers. Josef Maushart, CEO and President of Fraisa said: "I think opportunity in the tool and cutter market is significant. I expect a further growth of 2-3 percent a year and see especially high growth in solid round tools. To meet this demand, we are moving into a complete renewal of our tap production." "We knew that providing taps was a unique selling proposition for us as most of our competitors only manufacture endmills and drills. 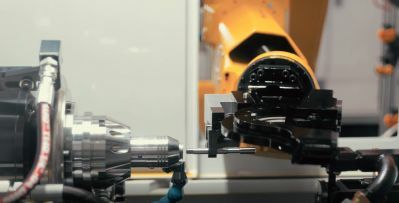 However, with high labor costs in Switzerland we needed to incorporate automation into the manufacturing process and that took us to the edge of technology as far as cutting tool production is concerned, especially with a complex tool like a tap." Fraisa wanted a machine that could grind multiple tap types unmanned for 50 hours. The classic way to grind a tap is to first grind the flute and then on a separate machine, grind the thread. The ANCA TapXcell combines these operations on a single machine which then meant there was opportunity to automate the entire process. Fraisa also wanted the flexibility to change the product without people being involved in the fabrication for small and large lot orders. Amelinda Ilardi, Engineering Project Manager, facilitated the collaboration with Fraisa. Amelinda said: "To remain competitive in high cost labor markets like Switzerland, Fraisa wanted a machine that could grind multiple tap types unmanned for 50 hours. There was no solution on the market and having collaborated with ANCA in the past, Fraisa approached us to develop the technology they needed." "To enable the machine to run unmanned we needed an in-process measurement capability to ensure grinding stability. 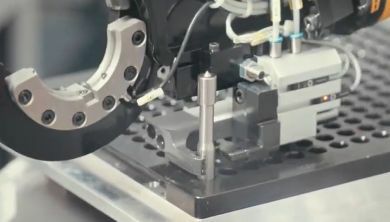 To do this we designed a new application where the thread pitch diameter is measured by a Renishaw MP250 touch probe. Measuring to ±0.002mm accuracy, this feature is crucial as it ensures every batch of taps are of consistently high quality." iTap software makes setting up all machine operations easy. 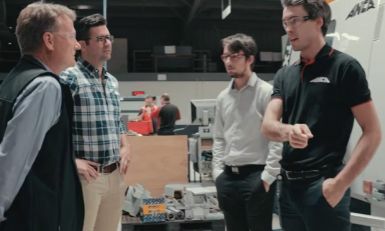 "Not only can the machine run unmanned for 50 hours, it is fully connected being linked to Fraisa's factory ERP system for further efficiency and reliable production data gains. The machine can be remotely monitored using our RedaX product and automatically sends notifications to keep Fraisa's remote staff aware of the machines progress and also any issues or faults that need to be addressed. In addition, RedaX can be used to track the productivity and up-time of multiple ANCA machines." "ANCA's commitment to innovation is by being able to deliver custom solutions as an enhancement to our standard product. This requires agile response and capacity in our engineering to deliver what can be quite a complex set of customer requirements," Amelinda concluded. Unique to the market, the TapXcell is a complete production package for tap manufacturers. The grinder itself includes a 37kW grinding spindle that enables grinding of even taps above M32, as well us dual wheel dressers and between centre work holding. 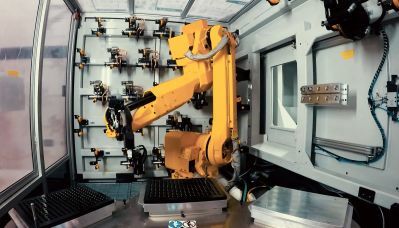 The benefit of the automation is a more engaged and skilled workforce who can focus on value-added work rather than just monitoring machines. Industry leading iTap software makes setting up all machine operations easy, even for the more complex tool geometries. Grinding capability is complimented by the TXcell's robot loader that manages auto changing of up to 24-wheel packs and tool changing. For Fraisa ANCA introduced an extended capacity turn table to the current TapXcell design to meet the additional capacity requirements. Josef continued: "ANCA has the capability and will to answer our specific requirements and collaborate with our teams to customise a solution fairly quickly. From previous projects I knew they had an experienced engineering team with the capabilities and capacity to take on complex challenges such as automating tap grinding." "As a CEO, I am often asked how a country with high labor costs like Switzerland can have such a thriving manufacturing sector. The answer is easy, Switzerland is one of the most innovative countries in the world. At Fraisa, innovation means we have a steady product renewal process and renew on average 800 of our 8000 articles each year. This is the evolutionary aspect of our business with daily improvements. But to really succeed from time to time it is important to have a revolutionary innovation." 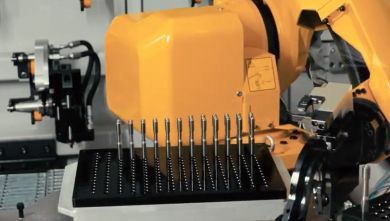 Most competitors only manufacture endmills and drills. Fraisa also manufactures taps. "With the change from the manned three shift operation for five days a week to the unmanned seven days operation we cut costs by half. This meant we increased the productive hours from 105 on average, to 150 per machine per week which will deliver serious efficiency benefits." Fraisa does not see unmanned production as a negative for its employees. Josef continued, "There are several advantages for our workers. We made the decision to retain their salary if they invested more time in upskilling themselves in other manufacturing processes. This benefits us as we have a more engaged and skilled workforce who can focus on more value-added work rather than just monitoring machines. It also offers them a better work-life balance by not having to work on weekends or shift work," he concluded.